MUMBAI: The Rajan Raheja owned multi system operator (MSO) Hathway Cable and Datacom, in which Star India has a strategic 26 per cent stake, has completed the process of setting up conditional access systems (CAS) and relevant infrastructure. The testing process is currently underway. News Corp technology arm NDS is the prime systems integrator and technology provider for Hathway's digital network upgrade and will also oversee integration of the set-top box, compression systems and subscriber management systems. Hathway Cable and Datacom vice president Neeraj Bhatia said. Bhatia confirmed to indiantelevision.com that a trans global NDS team is currently conducting exhaustive testing for the newly installed systems. "The process of training the local Hathway team - named as 'Operation Train the Trainer' was completed 10 days ago. Cable operator franchisees have been exposed to the CA system over the last few days," Bhatia says. While demonstrating the modus operandi, Bhatia says that Hathway will provide sophisticated intelligent Humax ND 1000C set top boxes (digital powered MPEG 2) to the consumers - with the Hathway brand name on each box. * On-screen displays for electronic programme guide - a banner on the TV screen actually displays the name and duration of the programme on any particular channel; also the complete list of all the pay channels with their detailed programmes with timings; in some cases, the consumer can also access a brief synopsis of any particular programme (say a Tom Hanks movie on Star Plus amongst others); the consumer can also fast forward the programme guide to anytime in the future and get a glimpse of the scheduled fare. * Using the services of a remote control, the consumer can be empowered to alter the displays as well as the duration of the on-screen display banners. The STB remote control has its own volume controls. * Ability to automatically switch on to certain favourite programmes at any time - for instance, a consumer can programme the STB remote control to switch on to a particular channel to watch a particular programme at any given point of time and the TV set will automatically display the programme at that point of time and alert the consumers. * The STB and the remote control will also allow the consumer to choose different "programme types" - movies (on movie channels as well as mass entertainment channels); education programmes, children's programmes, current affairs, music or arts programmes amongst others. * The STBs will also enable a parental lock facility. Parents can instal a certain key code and prevent children from accessing content that is deemed inappropriate for children. The NDS end-to-end system includes StreamServerä digital broadcasting management, VideoGuard® conditional access and NDS Core middleware have been installed in the Hathway Cable and Datacom operation centre in Mumbai's Lower Parel office. 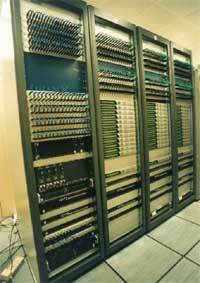 The changed system is effectively demonstrated by the presence of a rack of 13-15 encoders; QAM modulators for effective compression; Sun Microsystems and Compaq (application machines) servers. The actual CA system is enclosed in a security safe with round the clock surveillance systems (cameras, security codes, identification keys). The request will be punched from the the SMS (subscriber management system) that will talk to the CA system; which will authorise and send the message to the relevant box. Bhatia adds, "The Scientific Atlanta encoders installed are first of their kind in Asia. The system also includes a Statistical Multiplex Controller (SMC) to ensure effective compression so that no channel gets over compressed. There is full redundancy with provision for an optional encoder to take over automatically in case of an emergency. The switchover will take place so fast that the consumer will not even notice the difference." When queried about piracy, Bhatia emphatically states: "The important point about our CA system is that NDS doesn't send a key - it has a complex algorithm that acts somewhat like a key. Also NDS writes a different unique logic for each of its customers (read MSOs) - it is a stand alone system. And it is virtually impossible to crack the Hathway system even if someone has cracked the NDS system in some other part of the world. No one can crack the system as the security systems are impeccable." Bhatia also confirms that Hathway has added on several resources to undertake the task of compiling information about the various programmes on the pay channels so that the same can be fed into the central computer system and routed to the consumers via STBs.